Identification: Moyle (1976a); Scott and Crossman (1973); Wydoski and Whitney (1979); Morrow (1980); Eschmeyer et al. (1983); Page and Burr (1991). Native Range: Arctic and Pacific drainages from Anderson and Mackenzie rivers, Northwest Territories, through much of Alaska south to Sacramento River drainage, California; rarely to San Lorenzo River, southern California. Also in northeastern Asia (Page and Burr 1991). Table 1. States with nonindigenous occurrences, the earliest and latest observations in each state, and the tally and names of HUCs with observations†. Names and dates are hyperlinked to their relevant specimen records. The list of references for all nonindigenous occurrences of Oncorhynchus keta are found here. Means of Introduction: Authorized stockings took place in the 1930s and 1940s. The stocking in Idaho took place in 1939 (Linder 1963). The stocking in Maine took place in 1938 (Everhart 1950). The Michigan stocking occurred in 1945 (Emery 1985). Status: Stocking attempts failed to generate reproducing populations. Remarks: There is some question concerning the identity of the salmon stocked into Michigan. 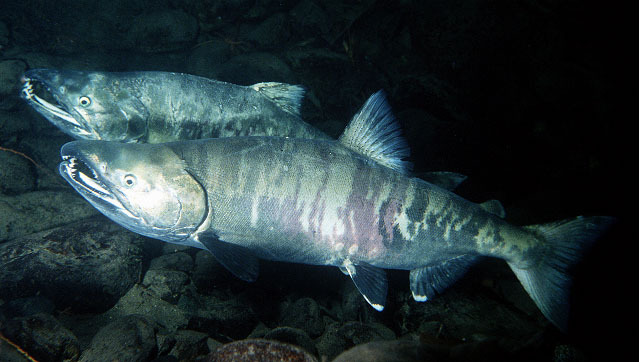 Emery (1985) reported that they may have been misidentified chinook or coho salmon. Parsons (1973) made no mention of this species being stocked in the Great Lakes.